The call of a white-tailed eagle woke me with a start. 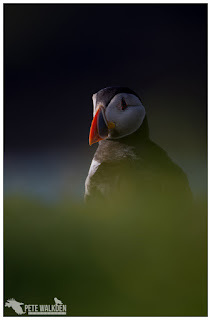 Despite the tent having a black-out lining, I could see a shard of morning light streaming in already and, with the chorus of nearby gulls greeting the dawn, I knew I'd never doze off again. 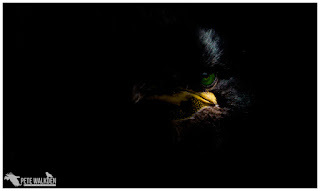 Peering out, I looked in vain for the eagle which had long gone, but the midges, absent when pitching the tent were back with a vengence, and I quickly retreated to safety inside. I was on Mull again, and after a night in a B&B, I had wild-camped overnight near the shore, ready to continue looking for the wildlife I hoped to share with clients over the next fortnight. Smidge applied, I soon gave up on the idea of folding the tent back into the microscopic canvas bag it was sold in, and dumped it in a footwell of the car. I'd agreed to meet Andy late morning for coffee, but that was hours away, and in the fine weather, I fired up the car, and drove over to a nearby loch. Despite my intentions to locate and photograph birds of prey for the days preceeding the Photo Tours, I'd spent most of my time crouched amongst boulders or lying in seaweed, watching otters. Not a bad thing, as our clients wanted to see some too. 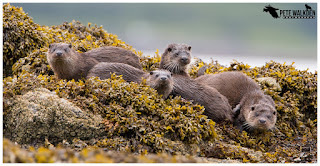 Having spotted one in a creek before arriving at Oban, and then another young-looking otter on my first afternoon on Mull, I was now approaching three individuals; a mother and two cubs, though one of them seemed to already be larger than his mum. I quickly saw why, when she brought ashore an eel that was about the same length as she was, and this youngster took ahold of it, and spent the best part of an hour eating every last inch of it. And he wasn't keen on sharing it either, scampering away when his sibling tried to join in the feast. 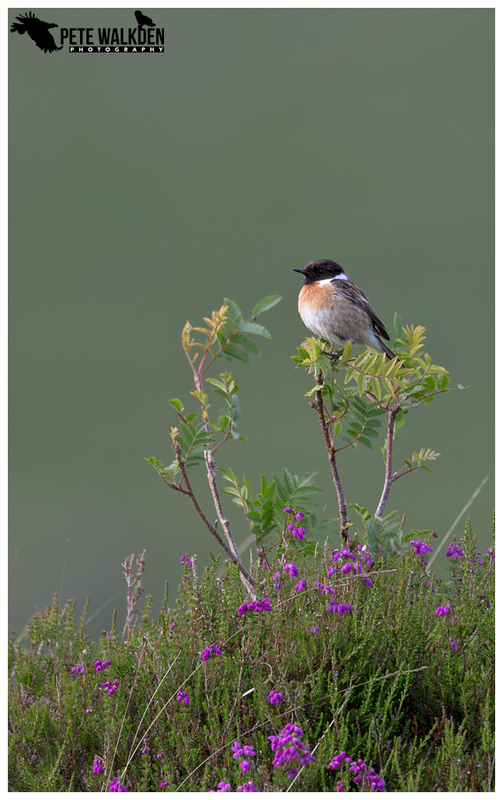 By the time I was parking up in Salen at the Coffee Pot to meet Andy, the fine weather had been replaced with heavy rain, and we took shelter inside, catching up on the last few days of searching for wildlife, as well as enjoying a coffee and some tasty snacks. Andy was keen to spend the afternoon searching for otters, so we returned to the area I'd seen the three earlier to continue looking. 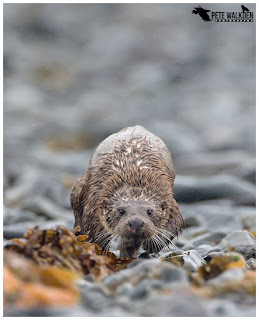 When Andy spotted an otter on some lochside rocks, we thought we might be in business, but another wildlife photographer beat us to the spot, and then inexplicably ran down the shore to photo the otter. Here's when we both thought something weird was going on, as if an otter sees a person they normally disappear, so one lumbering down the beach should have made it scarper halfway across the loch, but it remained on the shore for a few moments. It seemed reluctant to go in the water. Eventually it did, and swam along the shore towards where we were sat getting soaked in the deluge. 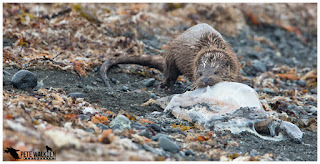 The otter brought ashore a crab, and paused to eat it on the shingle beach. Both of us had a decent view and began to take shots. But something wasn't right with the otter in my viewfinder. Its fur was too pale, and the sleek waterproofing seemed absent across large areas of its back. Also apparent were the signs of a recent and brutal encounter with another otter. Deep bite marks on the nose, puncture wounds and cuts around the muzzle, and another injury to this poor creature's paw. It was a young male and we think it'd bumped into the local dominant dog otter, and from this evidence, come off a very distant second best. It was a stark contrast to the amusing, sunlit scene of a safe, well-fed family earlier in the day, when I had to stifle giggles at the otters' antics. 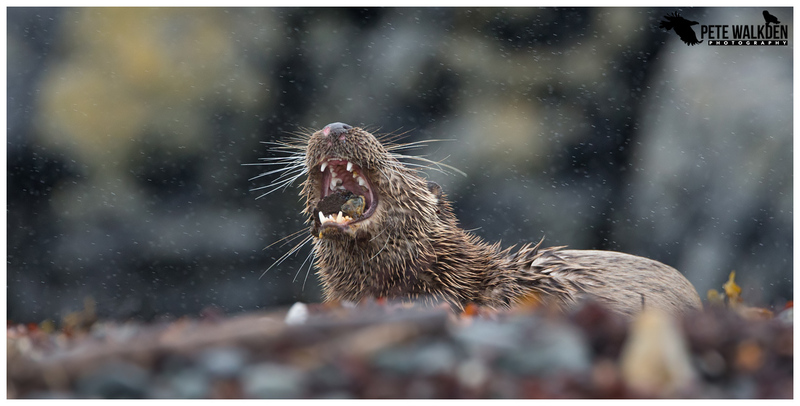 Now, in the grey gloom of a wet afternoon, there was another otter, struggling to survive after an extremely harsh lesson in life. 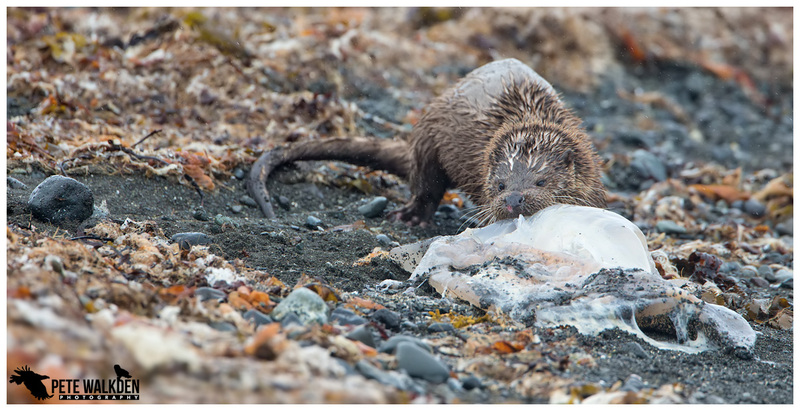 To witness an otter in such a state, to see it try to fashion a meal from a washed up jellyfish, and then prefer to limp along the shore towards its holt was a depressing sight. We feared the worst for it, but news of a poorly-looking otter surfaced later during the stay on the Isle, so maybe Mother Nature isn't finished with this creature just yet. The farmhouse we rent for the Photo Tours was available shortly after, and we were soon dried off and settled in. While Andy and I run the tours over the fortnight, we couldn't do it without the additional help from Andy's wife Lyndsey, who drove down from their Inverness-shire home with supplies and ingredients to prepare the meals for the clients. The evening flew by, and by mid-morning, Lyndsey was back on the road heading north, and we were welcoming our clients for the week. Both tours had the same itinery, subject to whatever the weather might throw at us. 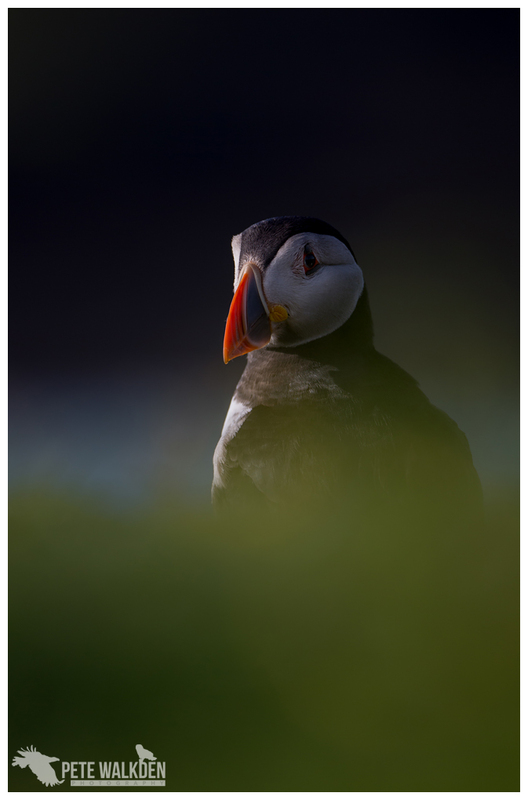 Thankfully the wet forecast prior to the drive up had been replaced with a mixed bag, and the first trip, out to the isles of Staffa and Lunga on the Turus Mara boat was blessed with sunshine and calm conditions. 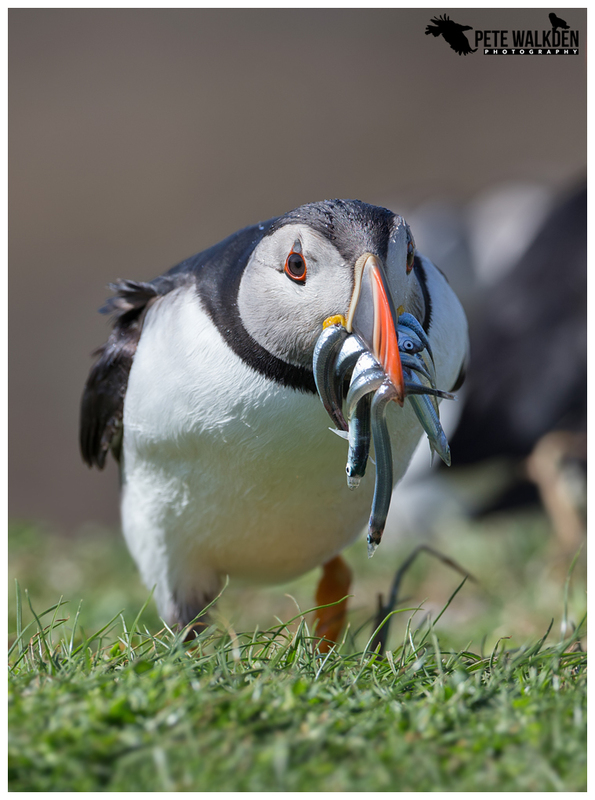 Lunga was first on the menu, to immerse ourselves in the antics of the puffin colony. Puffins are almost perfect wildlife photography subjects. They of course fly, they pose, they run about the place, often preen, collect nest material, bring back beakfuls of fish, and with a distinctive shape, can be backlit if so desired. And they're accommodating, and will let you know if you're in their way! For those that needed it, we offered technical settings, and also suggested shots to try for. 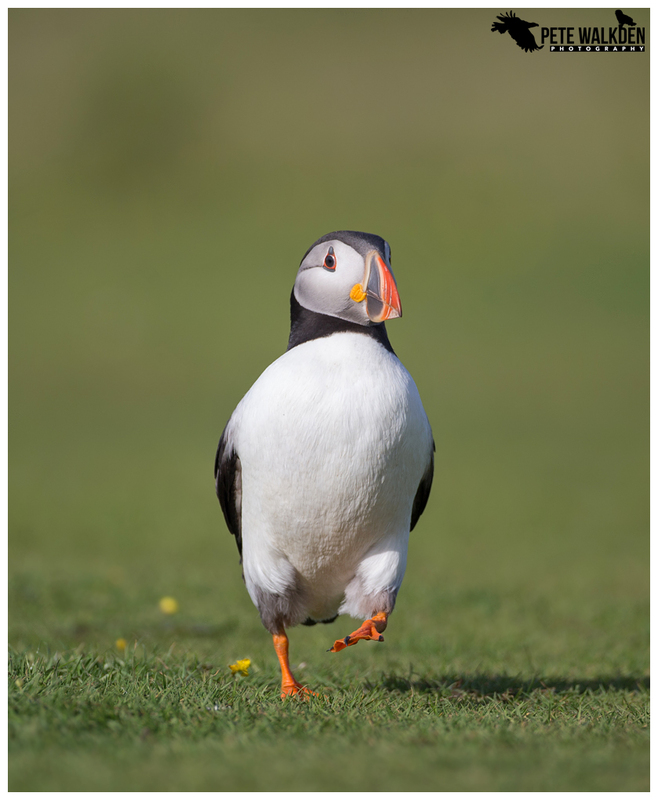 But even with such knowledge, capturing images of these colourful birds isn't so straightforward, whether it be tracking them as they hurtle past in flight, or trying to find an unusual angle to shoot them from, to perhaps reveal something different about their personalities. 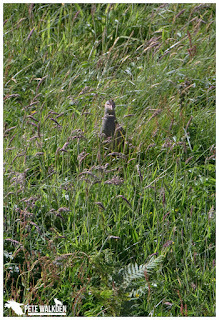 Lunga is also a good site for corncrakes it would appear, and we (well I) had more success here than on Iona! Despite us being on the longer tour, aimed specifically for photographers, the day flew by and we were soon back aboard the boat. Staffa is also visited and some chose to venture into the cave, whereas others climbed the steps to the top, where more wildlife can be found, including rare birds like twite. 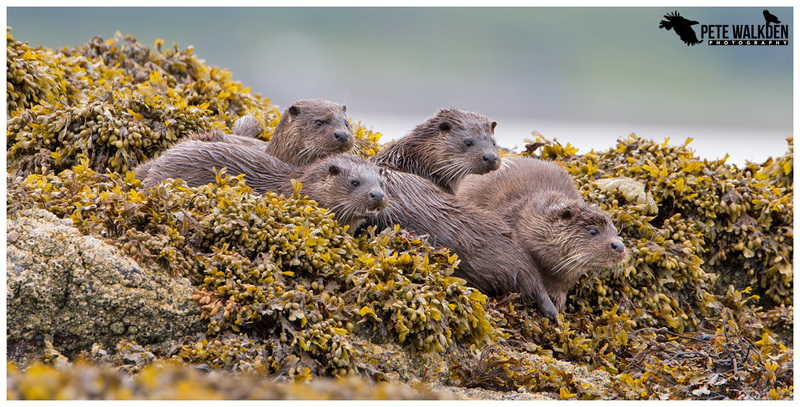 Two of the days of each week are set aside for looking for otters, and after spending time before the tours searching, we knew of some great locations. 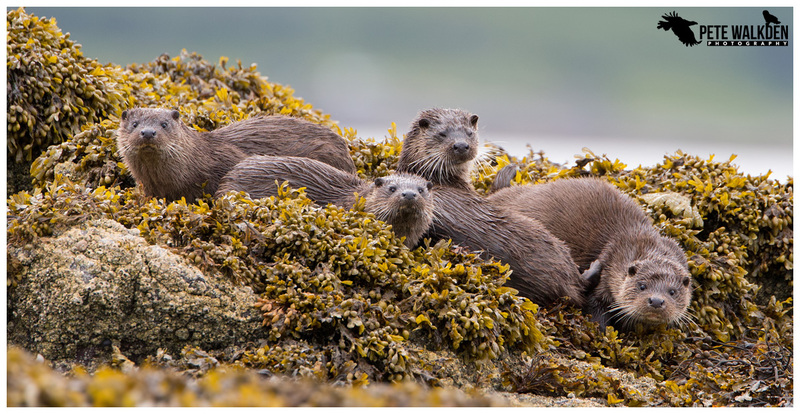 Even so, we are always on the lookout for new sites, and as we returned from the Lunga trip, Andy spotted a group of otters at dusk. Otters of course move around, so we were quite surprised to find them so quickly the following morning, and what a find it was too. Not one, not two but a mother with three cubs! I've never seen this before - she must be an incredible mother to have successfully raised three youngsters while feeding herself too. All looked fit and well, and when they gathered together on the rocks in front of us, the family was obviously at ease with one another. With so many in one place, we had to be ultra careful when photographing them. Cameras on silent goes without saying, but we had to show real self-discipline to only take a photo very occasionally. 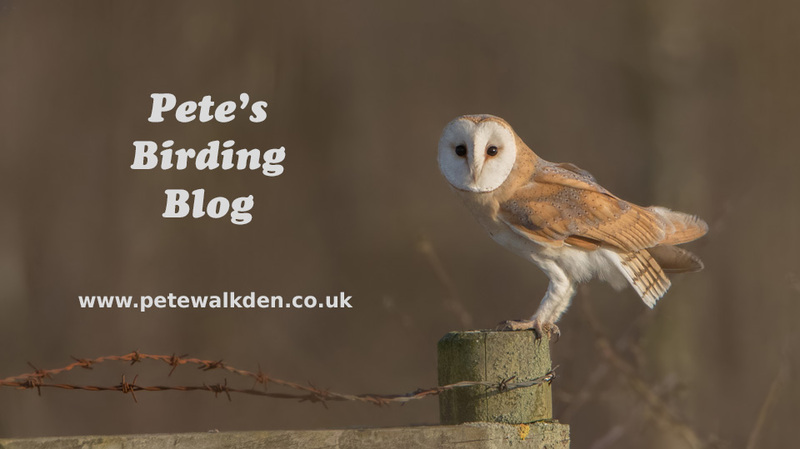 The last thing we wanted to do was spook the group, as that would risk dividing them up, and maybe one or more youngsters might lose contact with the mother. As it was, one by one they slunk back into the loch, and we watched the group head along the shore together, allowing us to quietly retreat back to the cars. The perfect encounter. 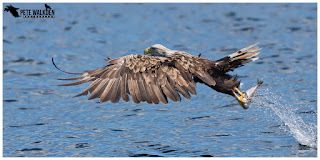 For a bird of prey fanboy, the Mull Charters trips scheduled during our tours were always going to be my personal favourite, and we were treated to almost perfect weather. Barely a breath of wind, almost clear skies and warm too. 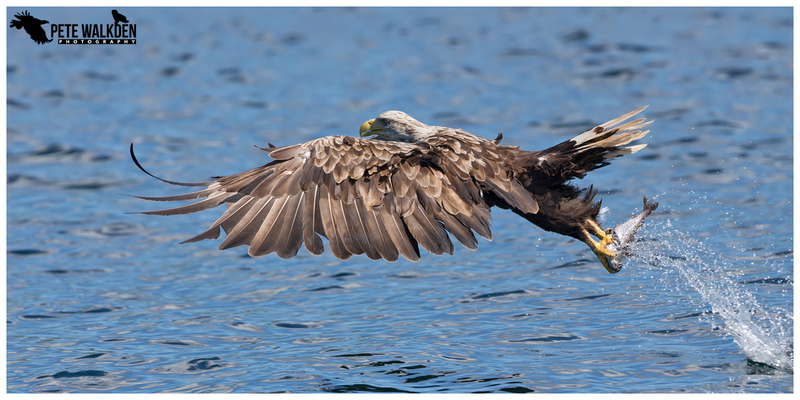 And the eagles didn't disappoint either, with both the public and then private charters delivering multiple dives from them. Taking time between dives to suggest new techniques, settings and even how to manage excitement or the stress of wanting to get that all important shot, we were relieved that the clients all left the boat happy. As for me, the calm conditions allowed me to wield my 500mm lens for a change, and this meant faster, more accurate focusing, and some more pleasing shots of these awesome raptors. The end of the first tour was a little disjointed, as one of the clients had to leave early due to a family tragedy and another who had been suffering with a back problem needed time away from us to have that looked at. As it was, the final day's otter watching for me turned into a one-to-one, and as the client had a poorly back, I had to avoid situations where we'd need to be lying down, in favour of a more relaxed approach; something I'm quite used to with trips with my Dad, who'd never get back up again if he was forced to lie down in the seaweed! After tracking an otter along the shore for about an hour, I tried to second-guess where it would climb ashore to groom. I was correct, though not with the otter we were watching. No, that one swam past, and I was just about to move when a second individual we'd not seen nearby, climbed out in front of us. We froze, and watched... and waited... and waited. For the best part of an hour the otter groomed and then mostly slept. 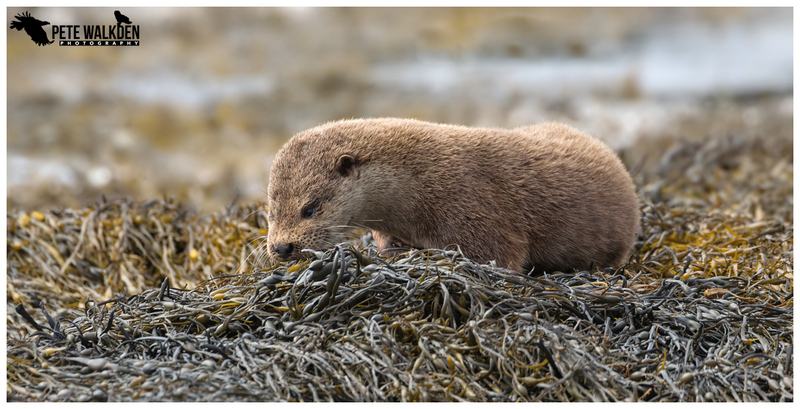 And our patience was eventually rewarded when the otter woke, rolled around, and then approached us briefly, sniffing at the seaweed, before slipping back into the water. The middle Saturday saw us bid farewell to the remaining clients, and go for a leisure drive up to Andy's family's house in the north of the island, where we disturbed Emma and Adam who'd just driven up from Wales, and had dozed off in the sunroom! Ah well, the sun was out and we all went looking for some local wildlife. 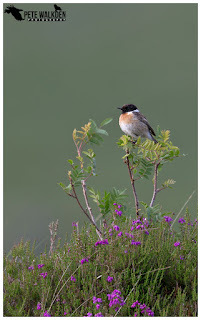 Whinchats, stonechats and wheatears were all in good numbers, and even a cuckoo made an appearance. 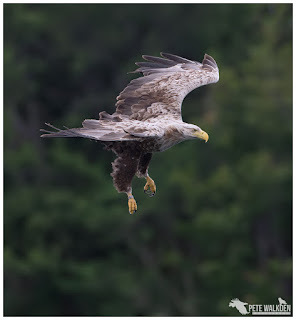 It wouldn't be a walk on Mull without at least one eagle showing up, and sure enough, we watched a golden eagle soar overhead, albeit briefly. 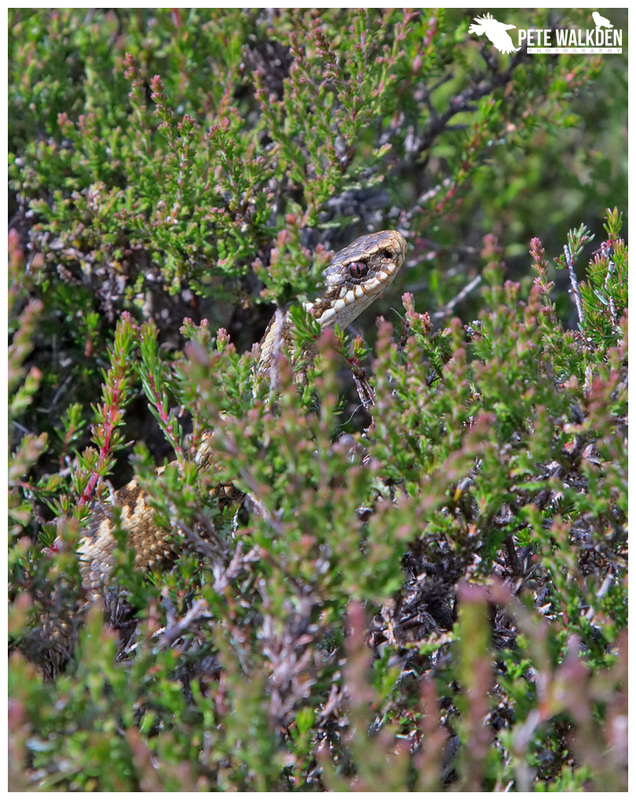 While the views from the cliffs were undoubtably breathtaking, we all found ourselves crouched around a rock, staring at what had just slithered beneath it. 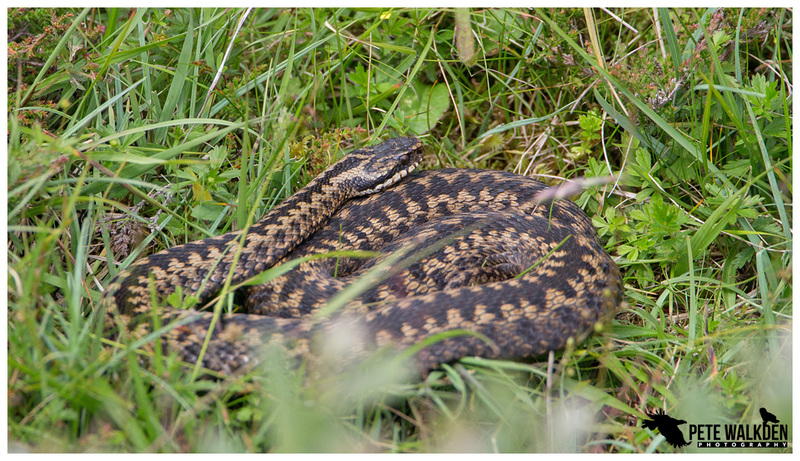 An adder! Emma had spotted it, and one soon became four. I had to borrow Andy's 24-105mm lens to get any sort of shot, while he made good use of the new 100-400mm zoom. 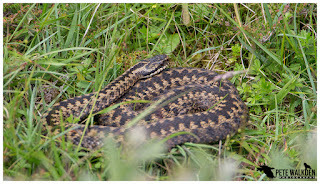 They're such wonderful creatures, and we had some good views when we all kept still and the sun brought the snakes back out into the open to bask. Fish and chips on the quay in Tobermory, the purchase of a few bits and bobs for the week ahead and an early night, before Andy and I prepared to welcome the guests for the second tour. With back-to-back tours one always wonders if one tour will be better than the other, or perhaps luckier with the wildlife. Not so with the second week, as the Lunga trip was as glorious as the previous one, though we stopped on at Staffa on the way to Lunga this time. Also in tow were Emma and Adam, who had scuttled off the Turus Mara boat ahead of me and had already found a small flock of twite on the island. 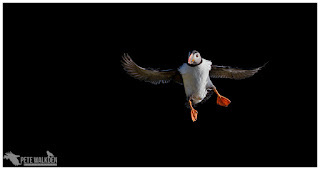 The puffins on Lunga were again on form, and once the daytrippers had left, we had the island and its stars to ourselves for the day. It really is wonderful there. And it's not just about puffins, as just a short walk along the cliffs is a huge colony of guillemots, with numerous razorbills, kittiwakes and shags dotted amongst them. The latter like to nest in gaps between large boulders, keeping in the shade on hot days. I was going to creep close for some shots but the shags can eject their waste some distance it would appear, so I kept mine! 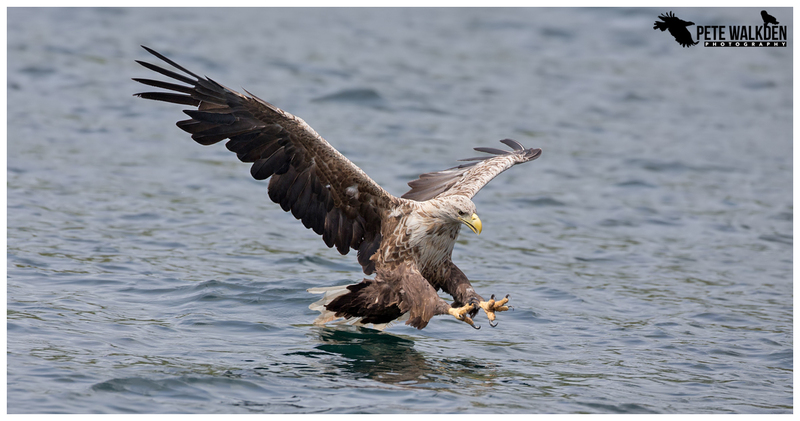 As with the first week, the Mull Charters boat trips were in fine weather, and we were again treated to numerous visits from the eagles. With Alex on a week off though, we were looked after by Oliver Wright, a professional photographer who specialises in hand-held stacked macro work. Not that he was practising such things on board the Lady Jayne... he was helping out and enjoying the show by the eagles, and at one point we were sat around with drinks and snacks, watching three white-tailed eagles soaring above us around the hills. Bliss! 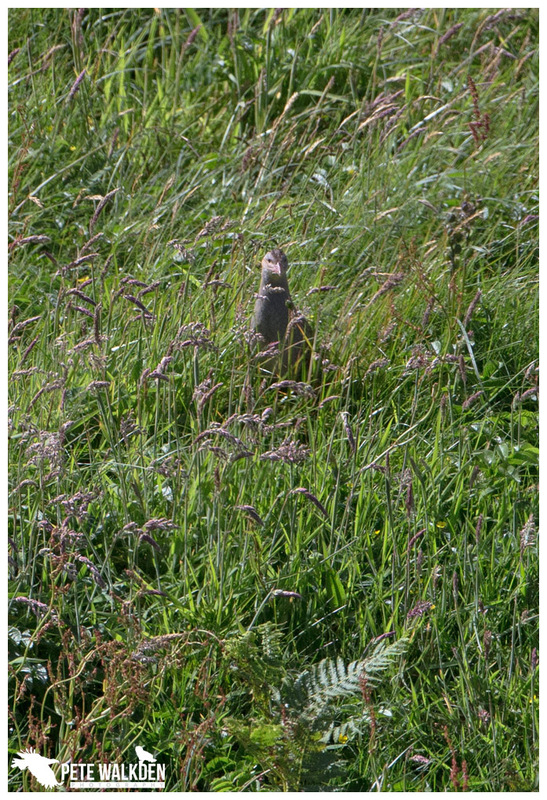 Both trips to Iona weren't blessed with good weather, and neither saw us have any success with corncrakes. Andy spent most of the time scouring the beach for shells, whilst on the second trip there, I thought it'd be wise to look for the corncrakes whilst the others enjoyed a coffee. Wise move for them, as it poured down, and I was soaked, and no, I didn't see or even hear one. While the tours are aimed at getting great images, it was actually an experience where no shots were taken that was treasured by two of the clients, and me during the second week. We had crept to the shore to watch an otter, and were sitting amongst rocks right on the water's edge when the otter brought a crab ashore. Initially out of view, the otter then clambered over the rocks and paused maybe six feet in front one client to look at him. The wind was in our faces so the otter couldn't smell us, and it continued along the shore, walking right past us, to climb on to another rock along the beach to groom. It was way too close to even move the cameras, let alone take any pictures. But to see a wild otter so close, and not to spook it was an incredible moment, and the smiles from us all showed clearly how we all felt afterwards.